Bubble Cheese from Big Buddha are cannabis seeds that are feminised. This is a nice and powerful weed strain. She is originated by crossing the Mr Cheese x Bubba Kush. This weed is mainly Indica dominant. Big Buddha Bubble Cheese is a weed strain with a nice sweet special taste. This weed plant is a strong plant with thick sweet smelling buds which contain an element of cheese. She is appropriate for an indoor grow and outdoor grow, and she is also quite easy to grow. This strain will be loved by the Hash fans because of her special taste. After smoking this weed you get a nice physical and mental high that feels very relaxed. 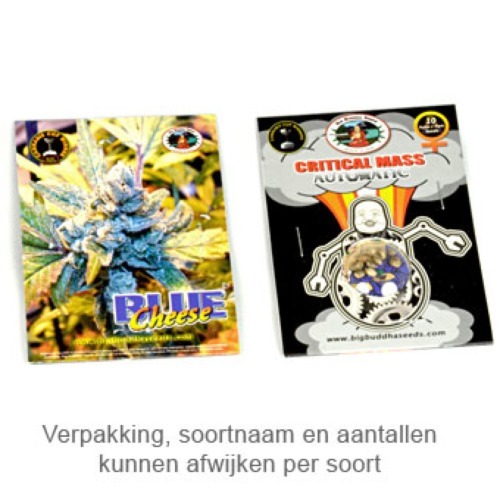 These feminised cannabis seeds are from very high quality and provide you a delicious weed. Tell us and our customers what you think of the Bubble Cheese from Big Buddha Seeds.